What makes Flightfloor® Eco unique? Flightfloor® Eco is a PVC-free product especially designed in accordance to the Airbus specifications. 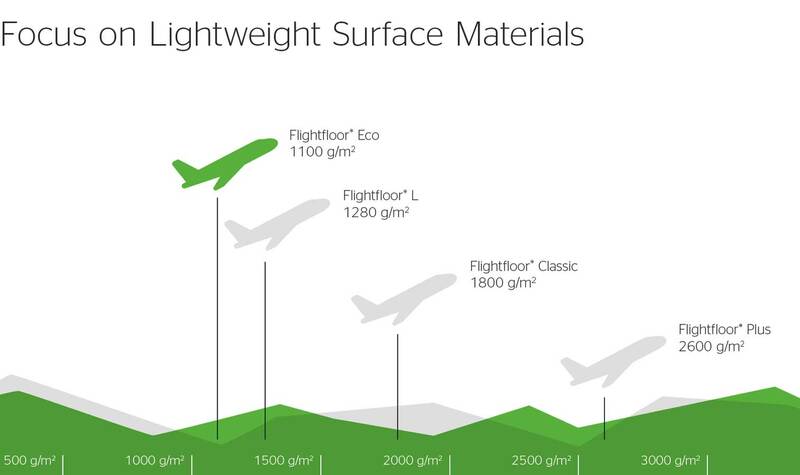 The brand new environmentally- and resource-friendly Eco range of the Flightfloor® product group, presents a number of exceptional advantages. Flightfloor® Eco is extremely lightweight, wear-resistant and halogen-free. This product now allows for even greater design scope and is suitable not only for aircraft requirements but for a large number of other areas, such as cruise liners, yachts and ferry-boats, passenger trains and underground, busses, coaches, motor homes, caravans and vans as well as for passenger elevators, paternosters and much more. Flightfloor® is a registered trademark of Continental Aktiengesellschaft and its affiliates in Germany and other countries.